There’s a time and a place for reading a ghost story. You can’t, for instance, read a ghost story on a crowded commuter train. Nor can you read it on a sunny afternoon in the garden . No – a ghost story should be read late at night, in the light of a solitary lamp that is casting weird shadows around the room. One may be sitting comfortably in a favourite armchair; or one may be in bed, shortly before putting out the bedside lamp and submitting to the dark. The story is all the more effective if there is a howling wind outside, making eldritch sounds at the window-pane; or, better still, if there is a deathly, still, silence – a silence that one dreads being broken. Recently, Tom in Wuthering Expectations – not, I believe, a diehard aficionado of the genre – has posted nonetheless very sympathetic accounts of some classic ghost stories. He identified different types of ghost stories, and quite rightly disagreed with my unargued assertion that the purpose of ghost stories is to evoke fear: a ghost story, he argued, could serve any number of functions. This is certainly true enough: but it’s the ones that evoke fear that I love the best. So, before I go on to prescribe, as I fully intend to do, what does and what doesn’t make for a good ghost story – or, at least, what makes for my kind of ghost story – I suppose I should describe the kind of ghost story I am talking about. I am not really interested in ghost stories that are comic, or satirical: comedy may act as relief to lower the tension at appropriate moments, but I remain to be convinced that one may laugh and be frightened at the same time. Neither am I interested in ghost stories that seek to evoke disgust rather than fear – a common failing, I find, with much of modern horror. I like the creepy type of story – the type that evokes in me a sense of supernatural dread. It may be said, with some justification, that it’s a comfortable type of dread: it is easy to feel fear when safely ensconced in a nice, warm bed, especially when that fear is caused by beings one knows to be imaginary. That’s true enough. But, as I was reminded during a recent visit to Hermitage Castle, irrational fear, inexplicable dread, unreasoned terror, are all too real, even if ghosts and vampires aren’t. One may be perfectly rational and not believe in the supernatural, and yet find certain places to be, for want of a better word, spooky, and prefer not to be there after dark. Why we should feel this way, I do not know: but the finest ghost stories – or, to be more precise, the finest ghost stories of the type I like – do, I think, evoke something of just this sort of fear – a fear all the more unnerving because its object remains so shadowy and vague. And that is important: as soon as the objects of fear acquires too distinct a solidity, the fear that its vagueness had occasioned naturally dissipates. This type of ghost story is, I think, a very conservative genre: its effectiveness usually comes from doing established things well, rather than from innovation. But since, as I have been told, and as I tend to agree, my cultural tastes are conservative anyway, I don’t have a problem with that. 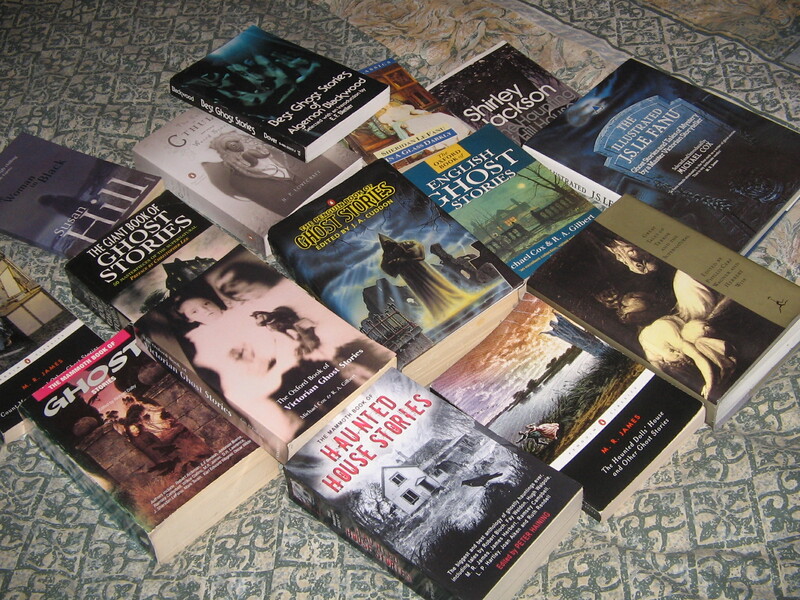 The master of the genre is, for me and for many others, M. R. James. What James understood so well is that the irrational is frightening for the very reason that it is irrational: it is precisely because the irrational irrupts into a solid and rational world that it terrifies. This is why I have never enjoyed the short stories of Poe very much: the framework of his stories is so far removed from the everyday, and the pitch is so hysterical to begin with, that when the irrational or the macabre does emerge, it is neither surprising nor incongruous. And I think this is also why I tend not to enjoy stories in which some sort of rationale is provided for the haunting; or when some alternative plane of existence, perfectly in accordance with the laws of nature were we to be fully acquainted with these laws, is hypothesised to explain the apparition. I am happy to suspend my normal rational frame of mind when the irrational is depicted as irrational, but when that irrational is rationalised by an alternative type of reasoning, I find myself getting bored. I have read far too many ghost stories that have been spoiled by over-explaining: what matters is the projection of a sense of terror, and presentation of some parallel fantasy world that explains the apparently inexplicable merely diminishes that sense of terror. Similarly with over-plotting: it is enough to know that phantoms haunt; we do not generally need to know why they haunt. There is nothing objectionable in suggesting some reason, but, once again, I have read far too many ghost stories that have been spoiled by too great an emphasis on this aspect: mere mechanics of the plot are rarely interesting, and the best ghost stories – once again, of the type I like – do not give us more of this than is absolutely necessary. M. R. James knew exactly how to do it. In story after story, he got it just right – neither complete bafflement, nor too much explanation that would detract from the terror; the terror glimpsed, as he put it, “in the corner of the retina”; and just the right depiction of solidity to make the supernatural appear incongruous, and hence, shocking. After all, we all expect unspeakable horrors in a Gothic dungeon, but when you are in your own room and you slip your hand under the pillow to retrieve your watch, and … No, sorry, I’d better stop here: I don’t want to spoil it for anyone who has not yet read “Casting the Runes”. As has often been remarked, the late Victorian and the Edwardian era – the era, in other words, in which M. R. James (and his namesake Henry James, who wrote probably the finest ghost story of them all) flourished – is the golden era for this type of story. Why this should be, I don’t know, although I am sure literary theorists have their own hypotheses on this matter: it’s probably all to do with social and economic changes, or something equally fascinating. But whatever the reason, the majority of the creepy stories I love were written in this period. And the sheer entertainment these stories have provided over the years has been immense. As I write, we are just a few days away from Halloween, but Halloween was never – in the UK at least – a particularly major event as I was growing up, and it still doesn’t register particularly strongly with me. Traditionally, in Britain, it was Christmas that was the time for ghost stories. There is something about the darkening winter light in these latitudes that particularly lends itself to this sort of thing. But Halloween or Christmas – what matter? Now the time of year is approaching when I can once again enjoy reading these stories on dark nights before switching off the bedside lamp. And now, on to the second of the tragic beef-witted lords – Shakespeare’s Coriolanus. When I last read this play, I was puzzled. Why, after exploring some of the deepest aspects of human existence, did Shakespeare choose to end his sequence of tragedies with this? That sequence had started some ten years earlier, with Julius Caesar. There are, admittedly, some earlier plays which may be considered tragedies: there’s the early Titus Andronicus, a play many Shakespeareans admit into the canon only with embarrassment, and excuse as being merely an early pot-boiler; and there is the exquisite Romeo and Juliet, which is in many ways closer to the comedies than to the later tragedies. There are a couple of history plays as well that may be considered tragedies – the demonic Richard III, and, a few years afterwards, the surprisingly lyrical Richard II. But despite these earlier forays, it was in 1599 that the great tragic sequence was set in motion by Julius Caesar, and soon, masterpiece followed masterpiece: Hamlet, Othello, King Lear, Macbeth – works regularly cited when we wish to refer to the very highest peaks of the literary imagination. And the sequence ended with two plays that seem to stand apart from the others in certain ways – Antony and Cleopatra, and Coriolanus. In the former, while not shirking the tragic, Shakespeare returned to the comic mode – and not merely as a means of providing relief: we are frequently invited to see the tragic protagonists themselves as comic figures, and, by the end, while we may sympathise or even empathise with these characters, we feel little sense of loss, little regret for what might have been. These are characters who never, even by the end, attain self-knowledge. In Coriolanus, Shakespeare takes us a step further down this road: Coriolanus isn’t even aware that there is any self-knowledge that needs to be acquired. What puzzles Antony doesn’t even begin to puzzle him, because he has never so much as considered it. He treads his tragic path without for one moment recognising its tragic gravity, never so much as experiencing any sense of loss, or of regret. How easy it would have been for Shakespeare to have shown Coriolanus consciously and heroically sacrifice his life to a greater, nobler cause; but this Coriolanus is too thick even to realise that he is in any danger: he goes to his death as he has lived – without a thought, without reflection, without awareness. Antony and Cleopatra, for all their shortcomings, seek for and finally give themselves to a vision of transcendence: Coriolanus, far from having a vision of transcendence, does not even have an adequate vision of the world he inhabits. He cannot even feel any of the shame that had so consumed Sophocles’ Aias. Apart from his physical courage, Coriolanus has no quality at all that is conducive either to sympathy or to admiration: merely a brute fighting machine, and no more. He does not even have in him any sense of patriotism: as soon as he is out of favour, he turns without compunction, without a thought, against the Rome that had formerly nurtured him. Any mental struggle is conspicuous only by its absence. The tragic sequence that had begun with the introspective Brutus and the intellectual Hamlet ends with this. What a curious trajectory! And Shakespeare depicts all this in the most austere of terms. Where Antony and Cleopatra had overflowed with bright, vivid colours and with some of the most gorgeous poetry that even Shakespeare ever wrote, Coriolanus has virtually no poetry in it at all: much of the play is in blank verse, but there is not a single passage, not a single line, that finds a place in the memory – not mine, at any rate: such prosaic blank verse I have never seen. Far from the kaleidoscopic hues of Antony and Cleopatra, what we get here is an unrelieved gun-metal grey. At the climactic point of this play, Coriolanus’ mother and wife plead to him to relent; compare this to the scene in Measure for Measure, where Isabella pleads to Angelo to relent: Isabella’s pleas are some of the most passionate lines of dramatic verse ever committed to paper, and the depiction of the mental turmoil this occasions in Angelo is extraordinary in its corrosive power: and yet, the same author who wrote those scenes in Measure for Measure could write the climactic scene of Coriolanus without conveying any such passion, any such power. It is not because he couldn’t: on the evidence of the plays written immediately before and after, his poetic and dramatic genius had not by a jot deserted him. If he doesn’t invest these scenes in Coriolanus with passion and power, if he keeps his soaring poetic imagination earthbound, it is because this is what he wanted. But why he should have wanted it so is beyond me. That this is indeed a great play I have no doubt: it is clearly the work of a master dramatist, fully in control of his art. But it continues to puzzle me. Greek tragedy is an area of literature that both attracts me, and, at the same time, keeps me at a distance. The reason for the attraction is obvious enough: the intense dramatic power of these works leaps across yawning chasms of time, and differences of cultural expectations, and of theatrical forms. But there remains that nagging question of how much of this can survive translation in the first place. Of course, for any literature not written in English or in Bengali, I am beholden to translators. But I do get the impression that the dramatic verse in which Greek drama was written is particularly resistant to translation: even in the most highly regarded of translations, I find occasional lines or passages that appear bathetic, and I am sure that is not the intended effect of the original. Also, when I compare translations, I find quite often a surprising variation in what is communicated by different translators (this is particularly so in translations of Aeschylus): this gives me the impression that the original is knotty and often ambiguous, and capable of being interpreted in many different ways. No doubt those who know these works in the original will tell me of the myriad subtleties and profundities, and of effects that only register in the rhythms and sonorities of classical Greek, that are beyond the reach of even the finest of translators. That may well be so. But something, surely, must survive. When I thrill to such passages as the agony of Cassandra before the palace of Argos, where she knows she will meet her death; when I read of Philoctetes howling in physical and moral agony in his lonely exile on the island of Lemnos; when I read of Hercules awakening from his god-induced madness and becoming aware of what he has done; I know that, even in translation, I am in the presence of something immeasurably wonderful: I know that Aeschylus, Sophocles and Euripides have looked into the same depths that Shakespeare had looked into in the greatest of his tragedies, and with the same unblinking gaze. Of course, I am no expert in either Shakespearean or in Greek tragedy, but with Shakespeare, I can, at least, claim to have read and re-read his works over several decades in the original language; my contact with Greek tragedy falls far short of that. So unfathomable are the depths I discern, and so superficial my acquaintance, that I had, and continue to have, great doubts about the advisability of writing anything at all on the matter. However, as long as it is understood that my comments here are no more than the rather diffident observations of a mere unknowledgeable novice, I suppose there can’t be too much harm done. So, on that understanding, let us proceed. It was the contemplation of Shakespeare’s Coriolanus that prompted me to try again Sophocles’ Aias (Ajax). In both cases, two supremely great tragedians have turned their attention to “beef-witted lords” – insensitive, unintelligent brutes, mere fighting machines lacking not merely self-awareness, but incapable even of acquiring it. The chorus in Aeschylus’ Agamemnon had told us that knowledge comes from suffering, but to Aias, suffering leads not to any kind of knowledge at all: it leads merely to despair. He is one of the very few Greek tragic protagonists who commits suicide: even Oedipus stops short of that. This play, certainly by the standards of modern stagecraft, is curiously structured. Aias kills himself in shame some half way through the action, and the rest of the drama focuses on a debate over his corpse on whether or not he should be buried with proper rites. Of course, we know from Antigone, or from the later books of the Iliad, how important in Greek culture was the ritual of burial; but even so, a debate, even an impassioned debate, seems something of an anti-climax after the suicidal despair of Aias that we had earlier witnessed at first hand. It seems almost like two rather different plays joined together. It is difficult possibly impossible, for someone like myself, with so little understanding of the form of Greek drama, to come to a full understanding of this; but in some ways, it rather encourages me that even scholars learned in this area have felt the same way about this play. But the more I think about this, the more it seems that the tragic despair of Aias, while certainly an important element of the play, is not really at its centre: at the centre is the question of the significance of the character of Aias in a changing world. Aias had been the strongest and the bravest of Greek heroes: his standing, and the esteem in which he was held, owed nothing to such qualities as nobility, or of sensitivity, or even of intelligence: he provided the brute physical strength that had been needed. However, the armour of Achilles, after his death, is awarded not to the great strong hero Aias, but to the cunning Odysseus: times have changed, and it is the brains of Odysseus that are of greater value than the muscle of Aias: Aias is in danger of becoming but an obsolete reminder of the past, a superfluous being. The opening scene of the play is startling. Athene leads Odysseus towards the tent of his great rival Aias, and exults at having driven Aias mad. Odysseus, although on the same side as Aias in the war, is also the personal enemy of Aias: indeed, had Athene not made Aias mad, Aias would have murdered Odysseus in cold blood. And so, as Athene exults in the madness of Aias, she expects Odysseus to do the same: but he doesn’t. Unlike the immortal, he, the mortal, is horrified by the depths to which his fellow mortal Aias has sunk. Compassion, it seems, is a quality possessed by humans, not by divinities. When we first see Aias, he is still in grips of madness. He is covered in blood (as, interestingly, Coriolanus is at one point in Shakespeare’s play), but it is not, as he thinks, the blood of those who have humiliated him: it is not the blood of Agamemnon or of Menelaus, or of Odysseus: it is merely the blood of animals that he in his madness has slaughtered. The great hero is shown to us at the very start of the play at his most unheroic. Athena finds this comical, but we, like Odysseus, may think otherwise. Once the madness dissipates, Aias is filled with shame. Here is a man who has no conception of himself other than as a great hero, a powerful warrior, and when he can no longer see himself in such terms, he cannot see himself in any terms at all. Aias’ occupation’s gone, and with it, his sense of his own identity. So great is his despair, that he takes his own life. And it is only then that the true theme of the play comes to the fore: what is the value of an Aias within a society in which his qualities, once so valued, are no longer considered so important? The second half of the play is taken up with an impassioned debate over Aias’ lifeless body. His half-brother, Teukros, demands the burial and the funeral of a great hero; Agamemnon and Menelaus, on the other hand, aware that their authority has been flouted, and aware also of Aias’ intention of killing them, refuse. The issue is resolved only when Odysseus, now very much the Man of the Moment, demands that Aias be buried with full honours. He doesn’t debate the issue: he merely demands it. And against Odysseus’ demand, not even Agamemnon and Menelaus can prevail: a person such as Aias may no longer be required, but a person such as Odysseus is. Odysseus provides the resolution to the play, and the memory of Aias is honoured; but it is clear that we are but honouring a relic of the past. We may be honouring this relic as a remembrance of the service he had once given; we may be honouring him for reasons of sentiment. But the very unsentimental truth is that the beef-witted lord Aias, now that his purpose has been served, is surplus to requirements: he is superfluous. And that, as I see it, is the essence of his tragedy, and of this curious play which, despite two very different halves, does, I think, hold together thematically. The translation I read was by James Scully, in a recently published volume containing all the existing plays of Sophocles translated by James Scully and by Robert Bagg. In the introduction, the translators tell us that the impression we have of Greek tragedy as that of unrelieved lofty grandeur is erroneous, and that the plays contain a wide range of tone and of mode of expression. This does come over admirably in the translation, although there were occasions on which it seemed to me to descend into bathos: but since this is a fault with just about every translation I have come across, I won’t count this as too black a mark. Generally, it did read very fluently, and I think it would sound very well if spoken on stage. There were, inevitably, a few liberties taken: in translating verse – especially from so different a culture – one cannot always be ideally true both to the letter and to the spirit of the original, and if forced into a choice, it seems to me preferable to err on the side of the spirit. For instance, Aias refers to Odysseus at one point as a “fox”, but that doesn’t convey the level of disgust and contempt in which the Greeks held foxes; so Scully lets Aias refer to Odysseus as a “foxfucker”. I personally have no objection to this, and rather enjoy the alliterative vituperation, but other readers may, I suppose, react differently. Certainly, I have enjoyed this translation sufficiently to make me want to read the others in this volume; but of course, I am in no position to say how close or otherwise this is either to the spirit or to the letter of the original. Like everyone else who runs a blog, I need to weed out from time to time all the spam messages I receive. But tonight, I found two mesages that had been labelled as spam by Akismet (the spam-prvention mechanism) that seemed to me to have been wrongly labelled: one was a comment on my review of a recent stage production of Antony and Cleopatra, and the other a comment on my recent post on the conclusion of Anna Karenina, and both comments seemed pertinent to the posts to which they had been appended. I declared these comments not to be spam, and set about replying to them. But something about them made me suspicious: I did Google searches on the texts of both comment, and found that the comment on Antony and Cleopatra had been taken word-for-word from a review of a DVD of that play, and the comment on Anna Karenina taken word-for-word from a pisspoor article on that novel that had appeared last year in the Guardian newspaper. In short, Akismet had got it right: they were spam. And yes, they both had links to some site that was trying to sell you something. Until now, it has been quite easy to spot spam from the content, but spam-merchants are obviously getting smarter. Do I have a message for them? I suppose i do, but would prefer not to spell it out on a family-oriented blog such as this. As for other bloggers – do watch out! What, will this line of Anna Karenina posts stretch out till the crack of doom? One more, and this the last, I promise. It’s hard to stop thinking about this novel. The conclusion of Anna Karenina continues to puzzle. After all Tolstoy has taken us through, Levin discovers God. And that, more or less, is it. Many have considered this a most lame and impotent conclusion. I too have not understood in my past readings – nor even, perhaps, in this one – why Tolstoy should choose to end this stupendous work in such a manner. However, it is unlikely that a writer who could scale such extraordinary heights would at the very end make so elementary a blunder; so it is best to try to understand. …and so on. Although she doesn’t understand it, we can: Vronsky had, after all, identified the body, had seen the mangled corpse of the woman he had loved. But to his mother, Anna was merely a “bad woman”, and that’s all there was to it. “And why such desperate passions?” she asks. Why indeed. Then, we see Vronsky himself. He is suffering from toothache. On one level, this is a marvellous Flaubertian touch: even when one’s soul has been ripped out, one is still subject to such everyday distractions as toothache. On another level, we remember that Vronsky had been described throughout this novel as possessing fine, white, regular teeth: that had become, as it were, his leitmotif, the label attached to him. The symbolic implications of his now having toothache hardly need emphasising. And Tolstoy doesn’t emphasise: he merely mentions it, and moves on. Vronsky is going to the wars. He might as well: there’s nothing for him to live on for. We see him on a railway platform, gazing on the wheels of a passing train. And all at once an entirely different feeling – not of pain, but of a general, agonizing inner discomfort – made him forget his toothache for an instant. The memory of seeing her mangled corpse suddenly floods back into his head. He remembers also the first meeting he had with her, also at a railway station. He tries to remember also their best times, “but those moments had been poisoned for ever”. His toothache now forgotten, his face is now “distorted by sobs”. This picture of Vronsky only takes up a few paragraphs, but one wonders whether mental agony has ever been depicted with such vividness and immediacy. Anna, after all, is not the only tragic protagonist of this novel. These remarkable chapters now done, we turn once again to Levin and to Kitty. Guests are arriving at their estate – just as guests had arrived at the estate of Nikolai and Maria at the conclusion of War and Peace. In these closing chapters, Levin, a man who, despite his happiness, is still searching for some meaning, has a moment of revelation – an epiphany, as Joyce might have called it. A peasant speaks of someone living “for his soul’s sake”, and these simple words set off in Levin’s mind a train of thought. All that he understands about what is good and what isn’t, about what is kind and what is cruel, he reflects, he has not learnt through exercise of reason: this sense has come to him by some other means. But how could this be? What possible means of comprehension can there be other than that of reason? He reaches the conclusion that those things which matter most enter our consciousness through some means other than that of reason. This is not to discard reason, but to accept that there are other important aspects to our being. All this may seem hopelessly naïve to the modern reader, used as we are to scoffing at anything that we may suspect to be sentimental. But Levin’s spiritual crisis is real enough, and this possibility – for it is no more – this possibility that dawns on him that there may be a way out is similarly real. It is not an instant transformation: Levin realises full well that he will go on living more or less as he does now, and that he will continue, as before, to lose his temper at minor things. But the possibility of a new approach to life has dawned on him: and on this note – a note not by any means of certainty – the novel ends. We may take this to be a false dawn: we are entitled to do so. It is indeed possible that nothing at all will come of this, and that Levin will go on searching. But it is equally possible that this is the first step towards a moral and spiritual regeneration. We cannot tell. But this ending, problematic though it is, is not, I think, quite as simplistic as is often made out. There is one final surprise before the final page. Kitty is in the midst of her domestic bliss: she is bathing her baby. And after bathing him, she “put[s] back on her slender fingers the rings she had taken off”. Now, slender fingers bejewelled with rings had been a leitmotif associated throughout this novel with Anna: and suddenly, and quite shockingly, it is applied to Kitty, who in the very midst of her domestic happiness. This is not to suggest that Kitty is another Anna in waiting: such an interpretation would be crude, and quite contrary to the nature of Tolstoy’s art. But it is, I think, to suggest that the shadows cast by Anna’s tragedy do not depart so easily; that the forces that had driven Anna to her destruction are with us all, even in our earthly happiness. Well, one can’t re-write the past. I know, for instance, that I have written some very foolish things about Jane Austen. I still am not a fan of Austen, and perhaps never will be, but I do know that the problem is not Austen’s writing but with my reading: my temperament is such that I find her brand of artistry difficult to come to terms with. But so what? Is this really something to write about? Why should I expect complete strangers who happen to chance across this blog to give a toss whether or not I liked Austen? The question surely is not whether I happen to like or dislike Austen, but, rather, “Do I have anything to say about Austen’s writing that may be of interest to anyone?” For if I don’t, I really should shut the hell up. The older I get, the less I am interested in mere opinions – even my own. Coriolanus is possibly Shakespeare’s most disappointing play. Dear me! Will the reputation of this play ever recover from such trenchant criticism, I wonder? I do go on to say, with some generosity I may add, that it’s not a bad play as such, but alas, the damage has already been done: that’s Shakespeare’s Coriolanus damned for ever. The question, once again, should be not whether or not I liked the play: that really is of no interest to anyone. The question is what I understood from the play that may be worth recording. And since I clearly didn’t understand enough, I felt it was time to give this another go. For, whatever my personal opinion of the play may be, it is a finished work – in a sense that Timon of Athens isn’t. Coriolanus does not give the impression of a play hurriedly cobbled together; neither is it a play (like Henry VIII, say) that appears to be a careless patchwork of the work of different hands. It is a highly polished play written by the possibly world’s greatest writer at a stage in his career when he could achieve more or less whatever he wanted to achieve. This is what he wanted to achieve. And for that reason alone, it demands our careful attention rather than casual put-downs. But what is one to make of this beef-witted lord? When Shakespeare had presented us with beef-witted Ajax in Troilus and Cressida, and had presented him as a comic figure – a big hunk of muscle, a mere fighting machine with no brain, no sensitivity, no self-awareness. What was Shakespeare thinking in making such a figure a tragic hero? I remember Orson Welles saying once that when Shakespeare was writing Hamlet, he realised how difficult it was to present as tragic protagonist an intelligent character, and that, thereafter, his tragic protagonists were all fools. Welles was exaggerating, but there is more than a grain of truth in this. If we follow the sequence of tragic dramas starting with Julius Caesar and Hamlet, and ending with Antony and Cleopatra and Coriolanus, we find the protagonists increasingly unintelligent, increasingly un-self-aware. Antony and Cleopatra, even by the end, do not win any measure of self-awareness; they have never entertained a serious thought in their lives, and, when they are faced with their own mortality, Antony is merely puzzled, while Cleopatra takes refuge in a mythology which, although magnificent, has little bearing to the reality we have witnessed. And finally, at the end of this trajectory of increasingly unintelligent protagonists, we have Coriolanus – the comic Ajax whom, Shakespeare now insists, we must see in a tragic light. Why is this? I really don’t know. But it seems worth investigating. And it seems worthwhile to read in conjunction with this another tragic drama about the original beef-witted lord – Sophocles’ Aias. So that’s currently my reading project – trying to figure out just what Sophocles and Shakespeare were on about. Should I reach even some tentative conclusions, I’ll put them up here: otherwise, I think it would be best to just shut up!